When you finally choose to focus on your own work – the world changes before your eyes. You can see what you were not seeing before. It is almost as if that choice moves you into position to receive the support you have been calling in. 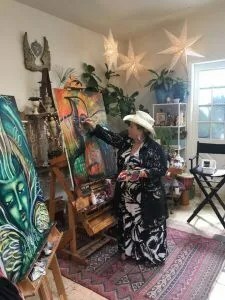 Engaging in experiences like Color of Woman, creates the initiatory ritual, that can move us from the way we have been being, into the new framework. Our own personal archetype development needs time and the tenderness of an archeologist’s brush. And perhaps even lots of chocolate and red thread. In the training, you develop a body of work, representing your own teachings and content. 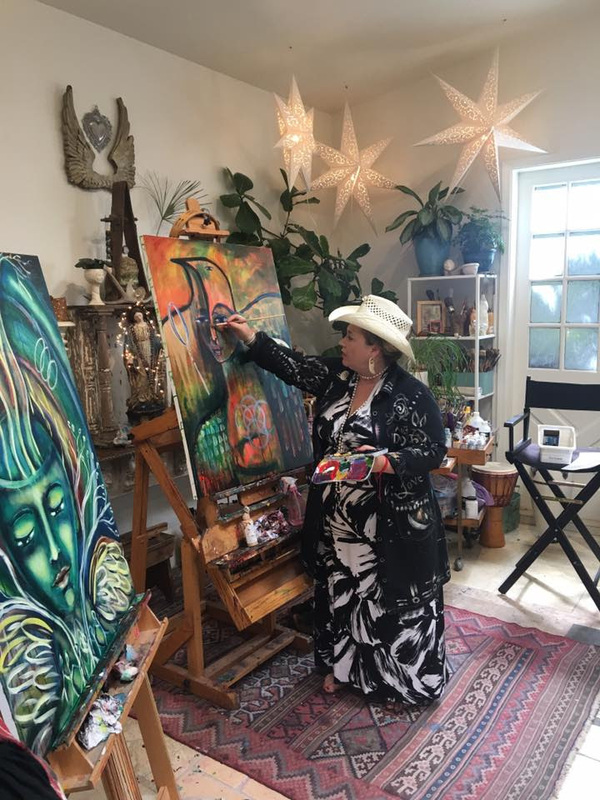 The Vision quest is the cosmic location in which you do the work, in the company of powerful guides and other creative beings called by something bigger than themselves. 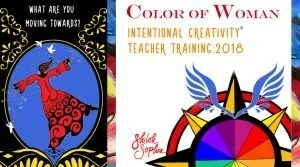 This is our 8th year of training teachers in the lineage of Intentional Creativity. Applications open in two weeks for pre-enrollment. If you feel called at all, enter the circle of interest. Our enrollment journey will include free classes on Intentional Creativity, poetry, conversation and so much more that the soul calls for. While we plan as much as we can in advance for how the enrollment journey flows – ultimately my Muse chooses each action – when, where, what, why and who. The “who” part, that is where you come in. No one needs a teacher training to learn to be creative or even to teach – we all have it within us. That said, we all need self chosen initiatory experiences that carry us forward – journeys that reveal us to ourselves. Color of Woman is that – most women say it was THE thing that changed their lives…. It is my birthday weekend – and I had space – and what wanted to happen in that space was sending this to you. Now we head to the mountain, to Terra Sophia, to be with the ravens and the trees – back to the place where I first learned to create with intention. I will carry you with me, I will. I always do. The poet Rumi tells us – ‘what you seek is seeking you’. Perhaps, you have called this invitation to you – while at the same time, we have called you. A message Emily Grieves gave to me : I can tell you that as someone who once studied art more formally, more academically, that I learned more from you in a shorter period of time than I did in 5 years of college. I sometimes stand back and wonder whether I did COW so I could teach or so that I could paint, and I’m still not sure, still torn, still questioning, but I do know that Color of Woman and my work with you allowed my own style to deepen and change dramatically, in a way that is perceivable to the people who have been looking at my work all these years.